In this workshop, participants will create unique valentines using custom laser cut stamps and folded pop-up elements. Physical drawings will be scanned and manipulated digitally (cleaned up, repeated, scaled, skewed, patterned, merged, iterated etc), laser cut digitally, and printed manually. Participants will experience the delights and pitfalls of physical/digital practice in this session as forms are revealed and obscured, details are lost and gained, and physical results offer last minute surprises. 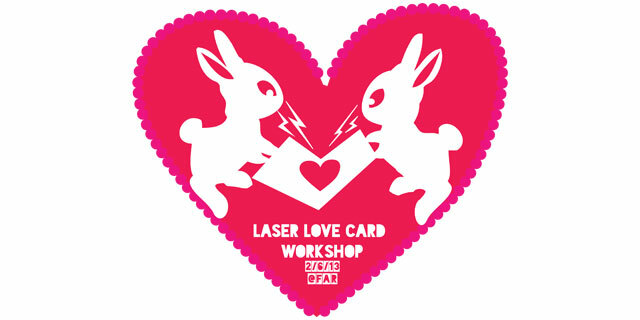 Participants will leave the workshop with custom stamps and a set of laser cut pop-up valentine cards. Workshop and material fee: $15. Visit http://artsresearch.fsu.edu/events/laser-love/ to learn more and reserve your seat.